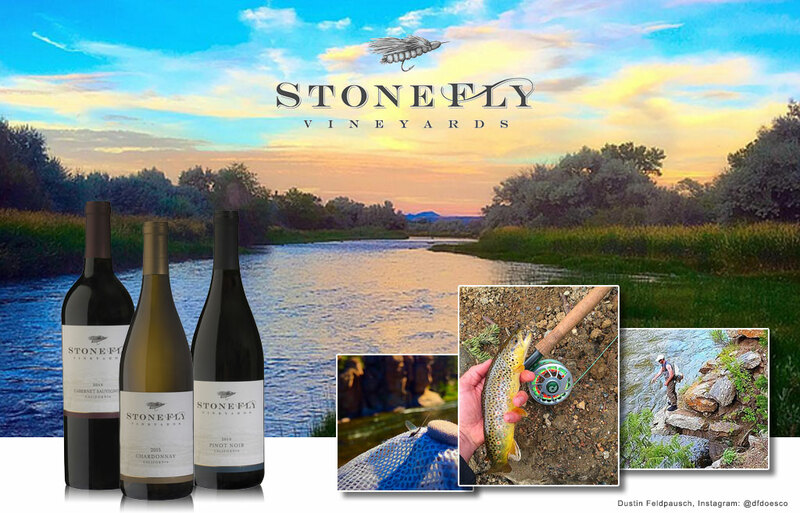 Stone Fly | How to toast a great day on the stream or wherever nature finds you. How to toast a great day on the stream or wherever nature finds you. If we had a favorite fly, no question it would be the stonefly. Stoneflies, members of the order Plecoptera, are good-sized insects found in clean, fast-moving, gravel-lined streams around the world. Trout, steelhead, grayling, and whitefish find stoneflies irresistible. And if we had a favorite wine to go with all of the great outdoors, it would have to be Stonefly Vineyards. Founded by friends obsessed with great fly fishing and wine, these wines are sourced from California’s best vineyards, farmed sustainably and in concert with nature. We think you’ll find them irresistible, too. Delicious fruit from premium California vintages are blended for this wine. Vibrant aromas of citrus and apple with hints of tropical fruit. Lush flavors with a rich texture and touch of toasted oak. A deep ruby color; vibrant aromas of black cherry, cola, and strawberry. A silky mouthfeel with soft tannins and a lingering finish. Rich and velvety, with aromas and flavors of ripe black cherry, fresh blackberry, blueberry and a hint of boysenberry with a hint of, vanilla, nutmeg and cedar. Smooth, integrated tannins and a medium-long finish.